Catching bass in cold, murky water is tough, but it can still be done. 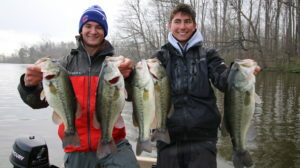 The depths of bass in cold, murky water depends on the weather. If it has been warm and sunny for three or four days, the fish are going to be real shallow. With the water off-color, the fish will move into water shallower than 1 foot. Bass will still be close to deep water though, so when the weather changes they don’t have to travel far to reach that deeper water. If the weather has been cloudy and cold for the last couple of weeks, then I would try to catch bass out a little deeper. 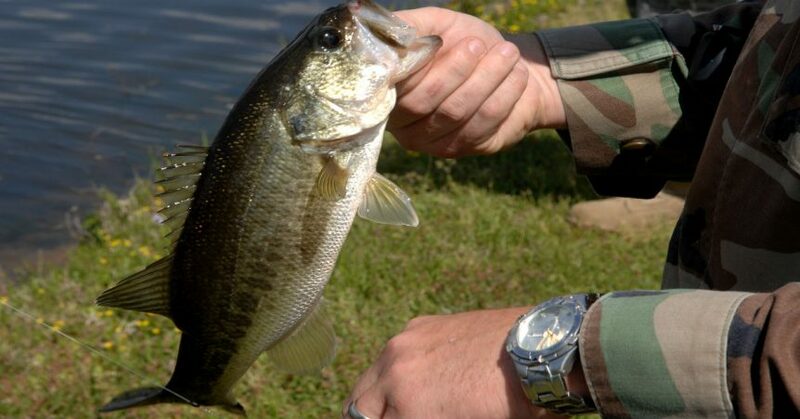 When bass move into the shallows during cold, murky water conditions, look for them along rock banks, creek channel bends and other spots close to deep water. Concentrate on the rocks because the water there tends to warm faster on sunny days. If the bass are staying in deeper water, concentrate on the creek channels and points. Checking the water temperature in off-color water is pretty important from late fall through early spring. Hunting for the warmest water available doesn’t guarantee you will catch fish though. You can still get blanked even when you find the warmest water available because the fish haven’t found it yet. Water can warm up pretty quick in the backs of coves, but a lot of times the fish haven’t moved that far yet to find the warmer water. Even if the water temperature is in the 40s, the sunshine will cause bass to move up close to the bank where you can catch these fish flipping. 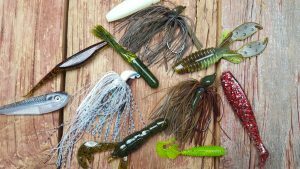 A 3/8-ounce jig with a loud rattle attached is ideal for flipping to bass in murky water. Attach either a plastic chunk or plastic craw to your jig as a trailer. Black/yellow or black/blue are good color combinations for your jig and trailer in murky water. A slow presentation is important when fishing cold, murky water. Keep your jig close to the bottom and barely move it. Present the lure to any visible cover, such as bushes or laydowns, along rocky banks or channel bends. If you caught a fish off of this type of cover before or you just feel a fish is there, you might have to throw four or five times to the spot to get bass to bite because the fish are usually inactive.